Industrial Test Systems Inc., of Rock Hill, S.C., has introduced the first kit that lives up to its name. COMPLETE measures for bacteria, nitrates, nitrites, ammonia, total hardness, total alkalinity, total chlorine, free chlorine, chloride, copper, sulfate, iron and pH. 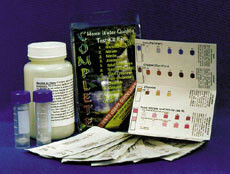 The kit gives the user rapid, comprehensive results that help to ensure safe drinking water without sacrificing cost.